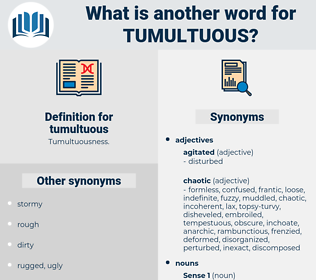 What is another word for tumultuous? unsettled, chaotic, precarious, destabilizing, unstable. 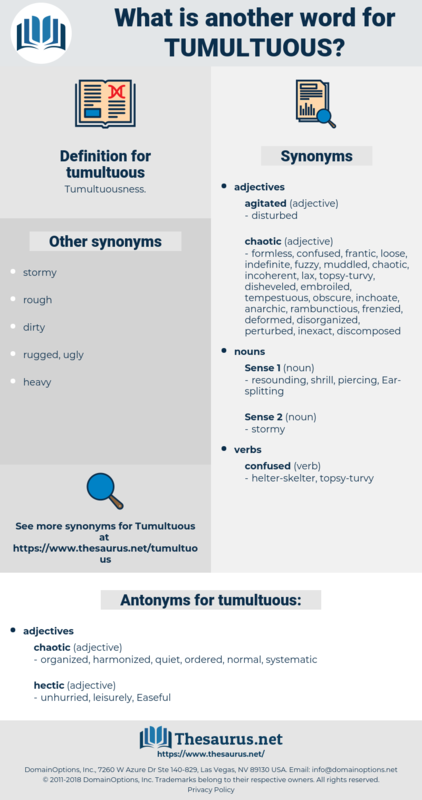 stormy, troubled, volatile, hectic, restive. organized, harmonized, quiet, ordered, normal, systematic. nonbelligerent, undisturbed, bright, fair, sunshiny, clement, pacific, unclouded, cloudless, sunny, nonviolent, halcyon, unshaken, clear, untroubled, peaceable, unperturbed, unaggressive. He could see the delicate white throat vibrating with the tumultuous beating of her heart. The crowd instantly caught her meaning; a shout rose, shrill, tumultuous, broken with laughter.